I grew up eating cornbread dressing for special occasions, such as Thanksgiving and Christmas. This dish, baked in the oven in a casserole-style baking dish, is made with savory homemade cornbread and fresh chicken or turkey stock. 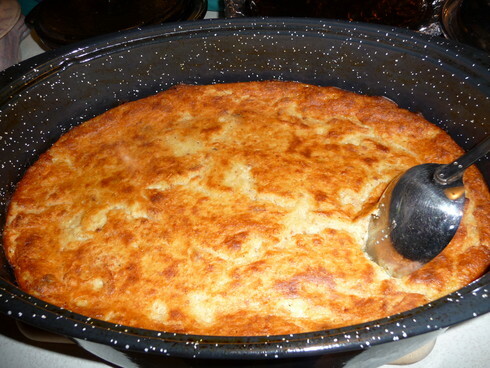 It is important to note that Southern-style cornbread is made with white corn meal and is savory, not sweet. I add fresh sage to this cornbread dressing recipe, but that is not the Southern tradition. This cornbread dressing should be VERY moist and is even better when topped with Southern-style giblet gravy. Put the crumbled cornbread and the crumbled toasted white bread into a large bowl. Add the two eggs and mix well. Mix in the chicken or turkey stock. Stir in the onions, chopped celery and sage (if using). Add the salt and pepper. Pour into a buttered baking dish. Bake for 35-40 minutes, until golden brown on top. Serve with turkey and gravy, if desired.